Printing postcards are great for personal use or business advertising. Make a statement and stand out with Velvet laminated postcards. They offer a rich and velvety texture different from any other card stock. They are sure to grab attention while remaining durable. This laminated cardstock is water and tear resistant and are scuff resistant. You can do it all with postcards; advertise a business, distribute coupons, use them as appointment reminders and more. 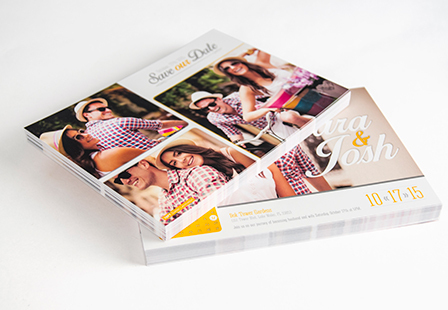 They can also be used as wedding invitations, photo cards, holiday cards and so much more. Select from a variety of printing options and sizes and demand attention with these 19PT thick postcards. Lamination: Soft velvet lamination applied to both sides of the card after printing increasing the thickness of the card to 19PT. Please Select 2" x 6" 2" x 8" 3.5" x 3.5" 3.5" x 4" 3.5" x 8.5" 3.67" x 8.5" 4" x 4" 4" x 6" 4" x 8.5" 4" x 9" 4.25" x 5.5" 4.25" x 6" 4.25" x 11" 5" x 5" 5" x 7" 5.5" x 8.5" 6" x 8" 6" x 9" 6" x 11" 6.25" x 9" 6.5" x 9"